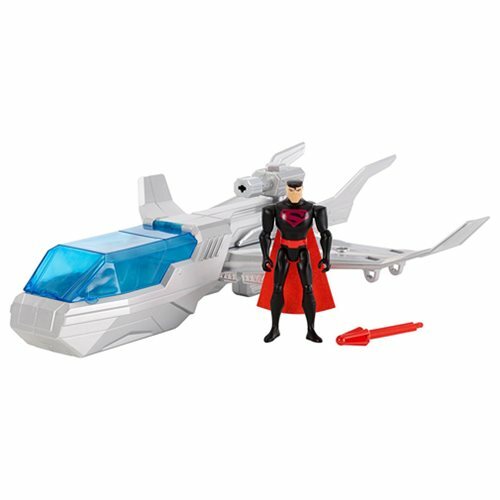 Fight evil, on land and in the air, with this Justice League Action Justice One and Superman Action Figure. Featuring the Justice One vehicle as seen in the popular animated series Justice League Action, this vehicle fits the 4 1/2-inch Superman action figure. It even fires, allowing you to reenact your favorite moments or create tense battle scenes. The 4 1/2-inch tall Superman figure comes with a detachable jet pack and is seen wearing a black suit with a red cape. The blaster and other weapon accessories are compatible with other figures from the same line (sold separately)! Ages 4 and up.